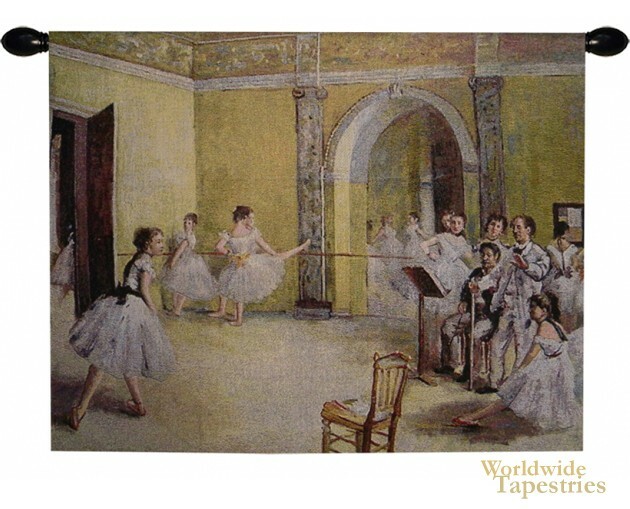 The Ballerina Dance Foyer tapestry is based on the work of Edgar Degas. Here we see ballerinas getting ready for a performance at the Parisian Opera on the rue Le Peletier in 1872 with the dance director and musicians. Degas was a painter in impressionism style, and the majority of his works depicted ballet and ballet dancers. His style ranged from impressionism to realism and his other works include the Dancers showing ballerinas on a blue background. The Ballerina Dance Foyer tapestry is backed with a lining and a tunnel for easy hanging. Note: tapestry rods and tassels, where pictured, are not included in the price.